Scientists have named a recently discovered species of Hawaiian coral reef fish after President Obama. Three marine biologists in Hawaii - Randall Kosaki, Richard Pyle and Brian Greene - had discovered the colorful small fish in the Bishop Museum back in June and planned to name the fish after Barack Obama and now they have successfully named the fish after the former US President. The fish is now formally dubbed as ‘Tosanoides Obama’. “This is a very special fish, because as far as we know, it is the only known species of coral-reef fish endemic to the monument, meaning it cannot be found anywhere else on Earth.” said Pyle, a scientist with Hawaii’s Bishop Museum. 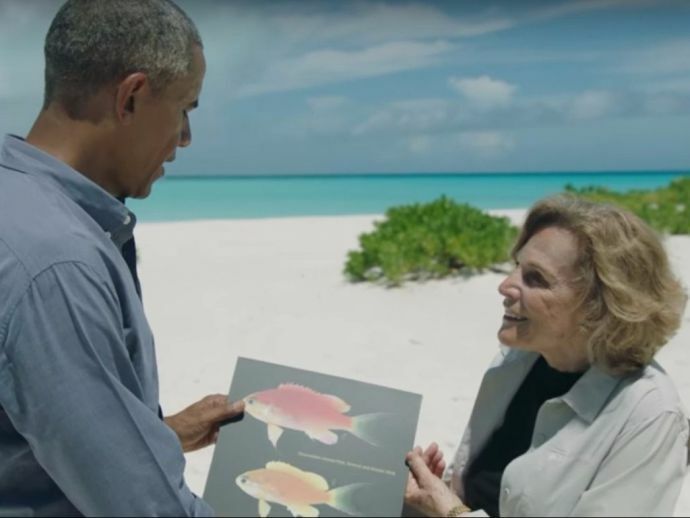 Naming the fish after President Obama is a tribute to him after he spent nearly a week during his tenure in creating the world’s largest protected marine monument by adding an area of 582,578 square miles which makes ample space for supporting 7,000 species. He also promised to give $40 million to island nations for protecting their marine reserves. “We decided to name this fish after President Obama to recognize his efforts to protect and preserve the natural habitat, including its expansion,” said lead author Richard Pyle, Bishop Museum scientist. Before this, scientists have named four other species after Obama which include a trapdoor spider, a speckled freshwater darter, a parasitic worm and an extinct lizard. However, researchers named another species after him even without seeking his permission and submitted his name to the International Commission on Zoological Nomenclature for approval.